TWM Presents in Halifax? It all begins with This Ship! See the poster at the top of this post? In all my years as a concert promoter, music fan, band manager, tour booker, and things of that sort, this is one of my proudest moments. I have never lived in Halifax. I have only ever been to Halifax once, for Halifax Pop Explosion in 2011–but I loved it! The music scene there is incredible, diverse, and one of the more interesting scenes I have come across in Canada. Within that scene there is a collective that goes by the name Berserker Lion. A few years back, the Cheap Speakers went out east on a tour I booked, and while they were there they saw This Ship. Tim came back raving about them to me; I checked them out and they were fantastic. Since then, I’ve kept an ear to the ground for all things Berserker Lion Collective and waited for the next chance to work with them. Fast forward a few years: I am booking a Cheap Speakers and Papermaps tour. Tim gets in touch with the Berserker crew, and they are super supportive in helping us set up the whole thing. 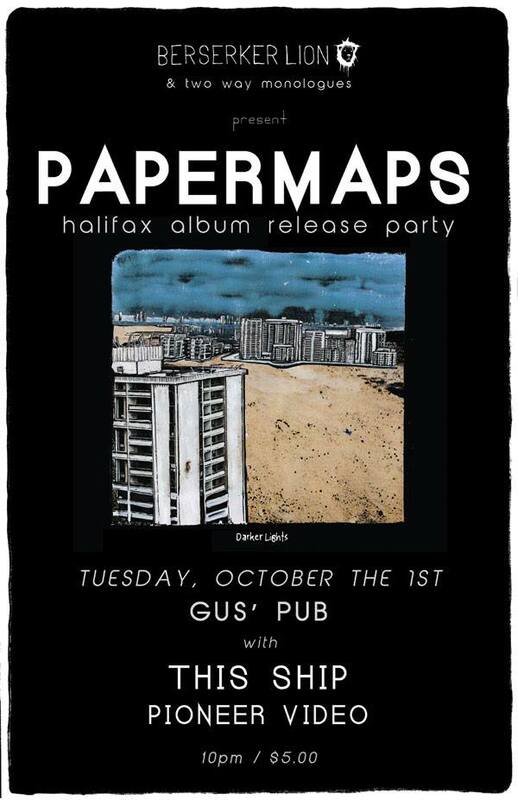 This Tuesday, Papermaps plays with This Ship and Pioneer Video at Gus’s in Halifax and TWM is co-presenting the bill! Maybe it will grow into something, maybe it won’t. But either way, it is cool as all hell. Speaking of This Ship, they have recently released a video for the track “What’s Left to Burn to the Ground” and not only is it a great video, but it is an even better song! Check it out above and get all the info you need on the show for Tuesday here. Toronto–keep your eyes and ears out for when This Ship comes back to Ontario, because you are not going to want to miss it.